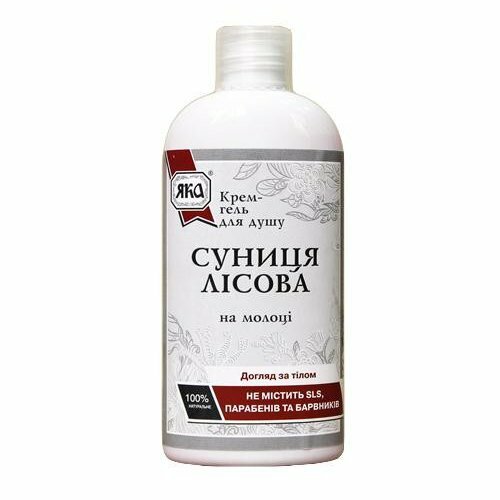 Wild Strawberry & Milk Shower Cream is produced by the Ukrainian cosmetic brand YAKA for its pharmaceutical series. It is formulated with wild strawberry leaf extract and milk powder. This shower cream has a rich, creamy texture. It takes excellent care of your skin, making it soft and silky smooth. Wild strawberry contained in the product in the form of leaf extract and fruit decoction improves complexion and has a light whitening effect. It helps to prevent premature skin ageing, eliminates acne and prevents its re-emergence. The shower cream also contains milk powder that intensively nourishes and softens the skin, has a pronounced hydrating effect and thus prevents dryness and flaking, improves skin elasticity. The product has a mild detergent formula and gently cares for your skin. It is enriched with natural herbal ingredients such as bergamot oil, grapefruit oil, clove oil, rose geranium oil, patchouli oil, Indian geranium oil and olive oil that enhance its effect. Directions. Apply onto wet skin, lather, rinse. Ingredients. Aqua/Water with Infusion of Wild Strawberry Leaf Extract, Decoction of Leaves and Strawberry, Sodium Cocoyl Glutamate, Disodium Cocoamphodiacetate, Cocamidopropyl Betaine, Milk Powder, D-Panthenol, Sorbitol, Citrus Aurantium Bergamia (Bergamot) Fruit Oil, Citrus Grandis (Grapefruit) Peel Oil, Eugenia Caryophyllus (Clove) Flower Oil, Pelargonium Graveolens Oil, Pogostemon Cablin Oil, Cymbopogon Martini Oil, Olea Europaea (Olive Oil), Natural Fragrance, Citric Acid. Want to buy Wild Strawberry & Milk Shower Cream? Call us or submit your order via our web site!